Military personnel know that it’s important to get and prepare gear long before a mission or outdoor trip. When you’re out in the field in the harshest conditions, how do you plan to keep the time? The best military watch will help you keep the time and more. Military watches are becoming more popular. Not only do they look good, they provide the much-needed precision timekeeping, top-notch durability, and other advanced features. If you are looking for the best timepiece that will inspire confidence in the field, you’ve come to the right place. We’ve spent several weeks testing numerous military watch models so you don’t have to. 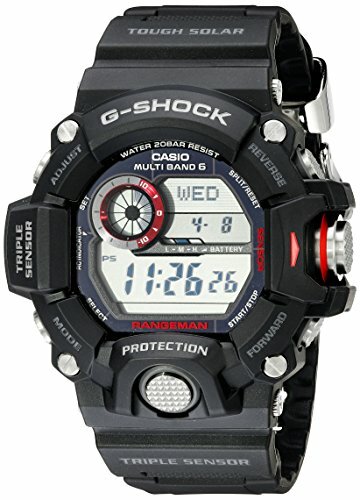 The Casio G-Shock GW-9400 Rangeman Solar Atomic was the top pick for our list of the best G-Shock for military. The GW-9400 Rangeman is an easy top-pick due to its masterclass durability, reliability, and a number of tactical features. The GW-9400 Rangeman proved to be a very popular model in the “Master of G” series. Firstly, any military personnel and outdoorsmen will love the Triple Sensor feature which means it offers a thermometer, barometer, and compass. Whether you’re in the deserts of Afghanistan or out in the mountains of Peru, the GW-9400 will allow you to accurately track the time and determine your position. It’s an Atomic Timekeeping watch which means that accuracy is not an issue regardless of your global position. It’s also solar-powered which means that you don’t have to worry about running out of battery. Ease of use is also excellent when it comes to the GW-9400 Rangeman. Each function is assigned with a different tone. Once you’ve familiarized yourself with the beeps, you’ll be able to operate the watch without even looking. What makes this model the best military watch is its durability and reliability. Trust me when I say that this is one of the toughest watches you’ll ever own. I’m quite the avid outdoorsman and this watch has yet to give me any problems. It’s an incredible military watch that offers amazing value. 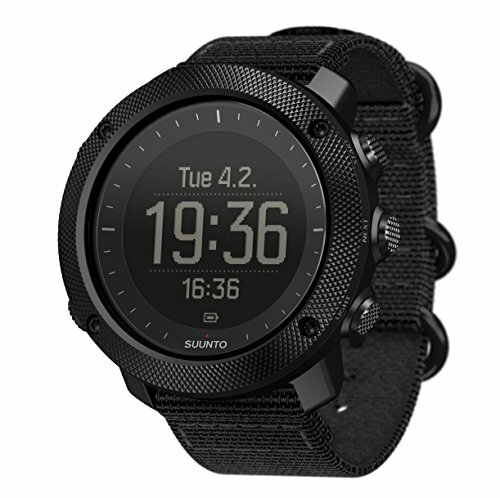 Whether you’re in the military, law enforcement, or an outdoor junkie, the Suunto Traverse Alpha is one of the best outdoor watches that you can get. The Suunto Traverse Alpha is a GPS watch that offers a ridiculous number of cool features. The built-in GPS is not just one of the best in terms of accuracy, it supports GLONASS navigation as well. For members of the armed forces, they can easily find out the coordinates of their current location. It also supports MGRS (Military Grid Reference System) coordinates which is a standard used by NATO armed forces. Setting up routes and waypoints is also a breeze and you can even import routes in various formats such as KML and GPX. The ability to set up waypoints and routes can help you tremendously when patrolling or hunting. The Automatic Shot Detection feature detects whenever a shot is fired and the coordinates are saved as a waypoint for future reference. Military folks will also love the addition of features such as altimeter, compass, barometer, thermometer, moon phase calendar, and a backlight that’s actually visible with night vision goggles. As you might expect, this is one tough timepiece, thanks to its sapphire crystal glass and knurled stainless steel bezel. It’s the ultimate outdoor timepiece for military members and outdoor enthusiasts alike. 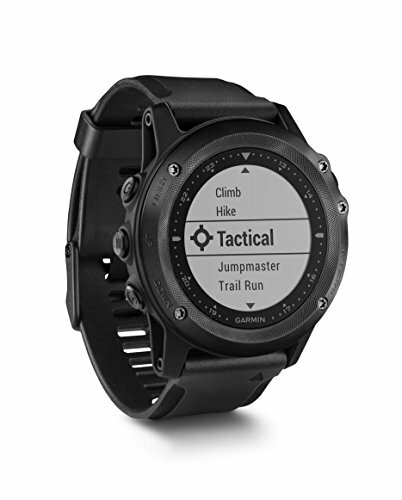 The Garmin Tactix Bravo is another sophisticated GPS watch that’s highly recommended for members of the military forces. Tracking and navigation are the highlights of this piece. The Garmin Tactix Bravo GPS was originally designed to be a watch for members of law enforcement. The all-black, non-reflective design is clearly catering to the specifications of a tactical operative. The 1.2-inch Garmin Chroma Display is quite a beauty on its own, and you can easily use it day and night because it features night vision goggle compatibility. The GPS technology of the Tactix Bravo also deserves praise. Setting up waypoints while in the field is about as it gets with this GPS watch. The GPS Coordinate Data Page is also MGRS supported. This is also a full-featured ABC watch which means that it comes with an altimeter, barometer, and compass. Garmin did a great job with the compass as it’s very accurate, especially when compared to similar models. The altimeter provides real-time elevation data which helps in determining your exact position. The TracBack is a neat feature that enables you to navigate back to your starting position with ease. The stainless steel bezel and buttons and 3-ring nylon straps are just some of the elements that make the Tactix Bravo a reliable outdoor watch. The only downside is that it’s quite on the expensive side. When it comes to the best military watch, you don’t have to take my word for it. However, if you want a model that’s actually recommended by the experts, you will want to check out the Luminox 3051 EVO Navy SEAL Colormark. That’s right, the Luminox 3051 EVO Navy SEAL Colormark watch is designed for the needs of Navy SEALs in mind. The end result is not just a watch that’s functional and reliable, it looks great as well. 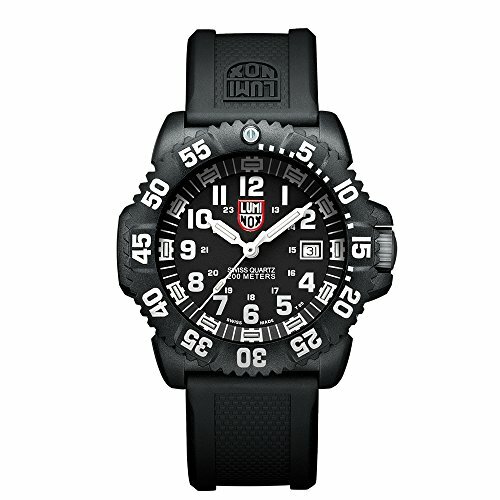 One of the first things you’ll notice about the Luminox 3051 is the big, bold display. This makes the watch very easy to read regardless of the lighting condition. This a 44mm watch so it’s best suited for users with larger wrists. It sits at 13mm high as well, so it’s fairly tall as well. According to Luminox, the tritium luminosity accents are 100 times brighter than the competition. With that said, I never encountered any issues as far as legibility goes. With that said, this is a distinguishable watch, thanks to some of its design elements like the pencil-shaped hands and absurdly large numbers. It’s an elegant sporty watch with the right amount of ruggedness for military folks. If you are looking for the best military watch that’s Swiss-made, the Victorinox Swiss Army I.N.O.X. comes highly recommended. While it doesn’t have as many features as the other models in this list, the main draw here is durability. I have always been a fan of Victorinox’s design and the INOX is no exception. This watch will sell itself with design elements like the matte black dial and applied hour markers. The watch boasts enough visual bling without sacrificing readability. As mentioned, the main selling point of the INOX is its durability. 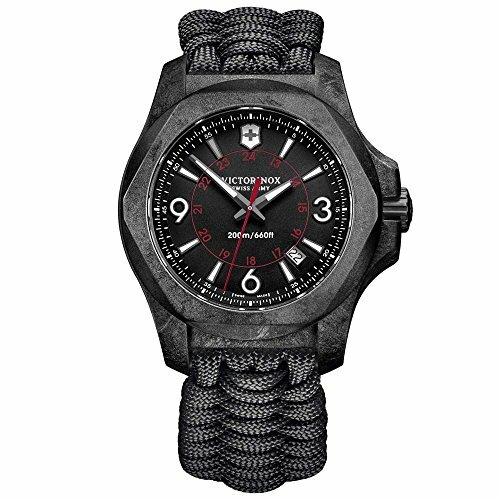 Victorinox claims that it has subjected the watch to 130 durability and strength tests. This should give you a rough idea of how much abuse and torture this watch can withstand. The 43mm case is constructed from stainless steel and protected by crystal sapphire. The watch is available in titanium for those who find the stainless model too heavy. The watch also comes with a paracord strap that adds a ton of durability to the watch. The INOX comes highly recommended for military folks who want a durable, tactical timepiece with Swiss-quality aesthetics. The Citizen AT0200-05E Eco-Drive Chronograph Canvas may seem super simplistic at first look but it offers incredible functionality with regards to tactical purposes. For hardware, the AT0200-05E comes in a stainless steel bezel and body, and a well-constructed canvas band. I’ve been using this watch for weeks and I have yet to observe any signs of wear and tear. Both the body and band give the impression that they’re superbly constructed. The watch is fitted with a Japanese quartz movement system and features an analog display. Accuracy seems to be on-point so far and the watch is a breeze to adjust if ever such a need comes up. 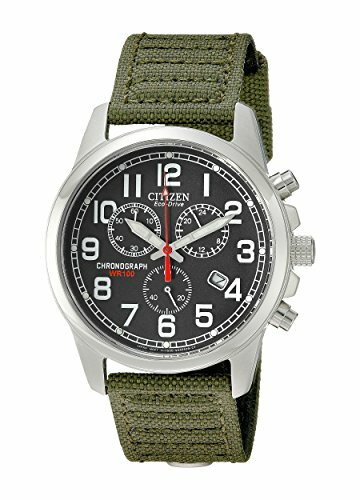 This Citizen model comes with a fully functional chronograph with 3 subdials for seconds, minutes, and hours. The main highlight of the timepiece is its distinguished aesthetic. The green canvas band alongside the stainless steel body really help in nailing that military-style design. The black dial and large silver numbers make the watch easy to read. As far as active/military-style watches go, the AT0200-05E Eco-Drive is an excellent mid-range option. It was not easy but we’ve managed to make this list of the best military watch that you can buy now. Regardless of your preference, we sure hope that this guide has helped you choose the right tactical timepiece for your needs. You can trust that each of these models won’t disappoint in terms of durability and reliability.